�����Peter Beiler was born on 13 November 1894 at Apatin, Yugoslavia. He was the son of Andreas Beiler and Elisabeth Mayer. �����Maria Daniel was born in 1885. She was the daughter of Peter Daniel and Dorothea Marthaler (Dora)(Eudora). Maria Daniel married C. Albert Schachtner, son of Joseph Schachtner and Maria R. Daniel, on 18 June 1912 at St. Peter, Beaver Dam, Dodge County, Wisconsin. As of 18 June 1912,her married name was Schachtner (Daniel). Maria Daniel died in 1965. �����Adam Nadler was born on 7 May 1895 at Apatin, Bacs-Bodrog varmegye, Hungary. He was the son of Anton Nadler and Rosina Nebl. �����C. Albert Schachtner was born in 1888. He was the son of Joseph Schachtner and Maria R. Daniel. C. Albert Schachtner married Maria Daniel, daughter of Peter Daniel and Dorothea Marthaler (Dora)(Eudora), on 18 June 1912 at St. Peter, Beaver Dam, Dodge County, Wisconsin. C. Albert Schachtner died in 1966. �����Franz Mathes (Mathecz) was born on 11 August 1869 at Apatin, Yugoslavia. He was the son of Michael Mathes (Mathecz) and Anna Nebl (Mathecz). Franz Mathes (Mathecz) died on 2 January 1872 at Apatin, Yugoslavia, at age 2. �����Josef Mathes (Mathecz) was born on 1 January 1868 at Apatin, Yugoslavia. He was the son of Michael Mathes (Mathecz) and Anna Nebl (Mathecz). Josef Mathes (Mathecz) died on 16 January 1872 at Apatin, Yugoslavia, at age 4. �����Simon Mathes (Mathecz) was born on 31 July 1864 at Apatin, Yugoslavia. He was the son of Michael Mathes (Mathecz) and Anna Nebl (Mathecz). �����Robert David Anthony was born on 16 April 1957 at Brooklyn, Dane County, Wisconsin. He was the son of David Charles Anthony. Robert David Anthony was Farmer at Rutland, Dane County, Wisconsin. He died on 16 May 1996 at age 39; Killed when tractor overturned. �����Anna Mathes (Mathecz) was born on 22 July 1865 at Apatin, Yugoslavia. She was the daughter of Michael Mathes (Mathecz) and Anna Nebl (Mathecz). �����Anna Udvari was born on 20 April 1873 at Apatin, Bacs-Bodrog varmegye, Hungary.2,3,1 She was baptized on 20 April 1873 at Apatin, Bacs-Bodrog varmegye, Hungary.4,3 She was the daughter of Franz Udvari and Eva Zahner. Anna Udvari was also known as Udvary.5 She married Wendelin Nebl, son of Adam Nebl and Rosina Beiler, on 19 November 1889 at Apatin, Bacs-Bodrog varmegye, Hungary.6,7,1 As of 19 November 1889,her married name was Nebl (Udvari). Anna Udvari emigrated on 20 September 1904 from to America, Beaver Dam, Dodge County, Wisconsin; with her daughter, Maria Katalin (Mary); her son, John (Hans); and her daughter, Katalin (Katherine) to join her husband and their father, Wendell NEBL. She appeared on the census of 18 April 1910 at 415 Madison Street, Beaver Dam, Dodge County, Wisconsin; NEBL, Anna: Mother-in-law; Female, White, Age 37; Married-1 for 22 years; 4 children, 3 living children; Born in Hungary-Magyar, Both parents born in Hungary-Magyar; Immigrated 1904; Speak German; Occupation - None; Read and Write = Yes.8 She died on 25 June 1949 at Beaver Dam, Dodge County, Wisconsin, at age 76. She was buried after 25 June 1949 at St. Peter's Cemetery Beaver Dam, Beaver Dam, Dodge County, Wisconsin. [S77] Austin "Gus" Sexton, 27 Feb 2000, Udvary (Udvari) Register. [S50] Unknown subject entry, unknown record type, Apatin, Hungary; 1872 , Line #152. [S55] George Eotvos, "Nebl *** Hungary." [S50] Unknown subject entry, unknown record type, Apatin, Hungary; 1873 #152. [S57] Josef Paul Schwend, Apatin Familienregister, p. 785. [S7] Nebl *** Hungary: Marriage record; Apatin, Hungary;1889 #92. [S57] Josef Paul Schwend, Apatin Familienregister, p.540. [S98] Unknown record type, unknown repository address, Wisconsin, Dodge County, Beaver Dam City (part of), Ward First; SD #5, ED #2, Sheet 6A; Line 33, Dwelling 87, Family 112; Ancestry.com image 16 Feb 2004. [S50] Unknown subject entry, unknown record type, Apatin, Hungary #289. [S98] Unknown record type, unknown repository address, Wisconsin, Dodge County, Beaver Dam City (part of), Ward First; SD #5, ED #2, Sheet 6A; Line 30, Dwelling 87, Family 112; Ancestry.com image 16 Feb 2004. [S3] Interview, unknown informant, Millie and John Andorfer. �����Casper Graff was born on 5 November 1883 at Apatin, Hungary. He was the son of Franz Graff and Anna Beiler.1 Casper Graff was born on 9 November 1883 at Apatin, Hungary; stated on the Declaration of Intention Naturalization document.2 He immigrated on 6 May 1907 to Port of New York, New York; Left Port of Fiume, Hungary on vessel "Carpathia." He married Maria Katalin Nebl (Mary), daughter of Wendelin Nebl and Anna Udvari, on 22 April 1909 at St. Peter's, Beaver Dam, Dodge County, Wisconsin. Casper Graff appeared on the census of 18 April 1910 at 415 Madison Street, Beaver Dam, Dodge County, Wisconsin; GRAFF, Kasper: Head;, Male, White, Age 21; Married-1 for 1 year; Born Hungary-Magyar, Both parents born Hungary-Magyar; Immigrated 1901 Alien; Speak German; Occupation - Moulder (Iron); Read and Write=Yes; Rents home.3 He died on 3 July 1961 at Milwaukee, Milwaukee County, Wisconsin, at age 77. He was buried at St. Peters Cemetery, Beaver Dam, Dodge County, Wisconsin. [S6] Nebl *** Hungary: Marriage Certificate for Kasper Graf and Maria Nebl; 22 Apr1909. [S72] Unknown repository unknown record type, Dodge County Circuit Court, Beaver Dam, WI 25 Sep 1913 (01 Feb 2000), unknown repository address. [S98] Unknown record type, unknown repository address, Wisconsin, Dodge County, Beaver Dam City (part of), Ward First; SD #5, ED #2, Sheet 6A; Line 29, Dwelling 87, Family 112; Ancestry.com image 16 Feb 2004. �����John Nebl was born on 26 July 1896 at Apatin, Bacs-Bodrog varmegye, Hungary. He was the son of Wendelin Nebl and Anna Udvari. 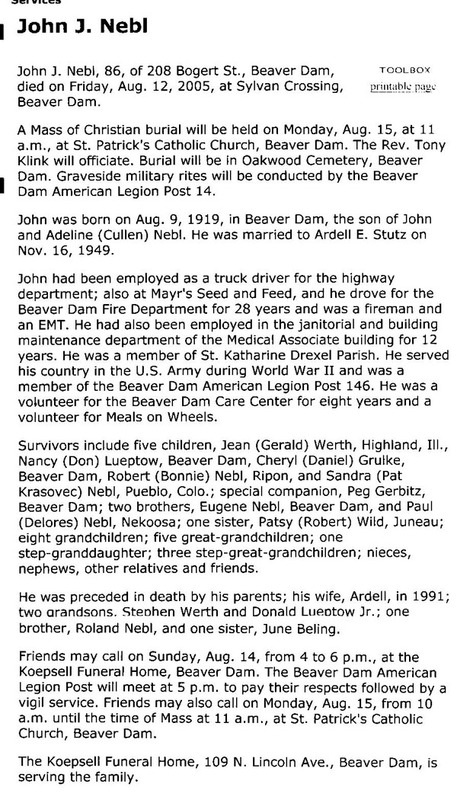 John Nebl emigrated on 20 September 1904 from to America with his mother, Beaver Dam, Dodge County, Wisconsin. He appeared on the census of 18 April 1910 at 415 Madison Street, Beaver Dam, Dodge County, Wisconsin; NEBL, John: Brother-in-law; Male, White, Age 14, Single, Born in Hungary-Magyar, Both parents born in Hungary-Magyar; Immigrated 1904; Speak English; Occupation - Laborer (personal); Read and Write = Yes; Attended school = No.1 He married Adeline J. Cullen, daughter of Peter Charles Cullen and Belle Smith, on 16 February 1917 at St. Patrick Catholic Church, Beaver Dam, Dodge County, Wisconsin. John Nebl was (an unknown value) at barber and proprietor of Beer Distribution business. He lived at Juneau, Dodge County, Wisconsin. He appeared on the census of 6 January 1920 at 110 Mill Street, Beaver Dam, Dodge County, Wisconsin; NABEL, John: Head; Male, White, Age 23; Married; Immigrated 1904, Naturalized 1917; Read and Write=Yes; Born in Germany, Both parents born in Germany; Speak English=Yes; Occupation - Edger (Shoe Factory).2 His Social Security Number was #391-18-9597 in Wisconsin before 1951. He died on 27 April 1969 at Wautoma, Waushara County, Wisconsin, at age 72. He was buried at Immaculate Conception Cemetery, Juneau, Dodge County, Wisconsin. [S98] Unknown record type, unknown repository address, Wisconsin, Dodge County, Beaver Dam City (part of), Ward First; SD #5, ED #2, Sheet 6A; Line 35, Dwelling 87, Family 112; Ancestry.com image 16 Feb 2004. [S137] Unknown record type, unknown repository address, Wisconsin, Dodge County, Beaver Dam Township, Beaver Dam City, Ward 2; SD # 36/2, ED #30, Sheet No. 6B, Line 82; Dwelling 125, Family 129; Ancestry.com image Feb 2004. �����Adeline J. Cullen was born on 10 February 1899 at Wisconsin; calculated from 1900 Federal Wisconsin census. She was the daughter of Peter Charles Cullen and Belle Smith. Adeline J. Cullen appeared on the census of 9 June 1900 at Willow St., Beaver Dam, Dodge County, Wisconsin; CULLEN, Adeline: Daughter, White, Female, Born July 1898, Age 1, Single, Born in Wisconsin, Both parents born in Wisconsin.1 She married John Nebl, son of Wendelin Nebl and Anna Udvari, on 16 February 1917 at St. Patrick Catholic Church, Beaver Dam, Dodge County, Wisconsin. As of 16 February 1917,her married name was Nebl (Cullen). Adeline J. Cullen lived at Juneau, Dodge County, Wisconsin. She appeared on the census of 6 January 1920 at 110 Mill Street, Beaver Dam, Dodge County, Wisconsin; NABEL, Adeline: Wife, Female, White, Age 20; Married; Read and Write=Yes; Born in Wisconsin, Both parents born in Wisconsin, Speak English=Yes; Occupation=None.2 Her Social Security Number was #390-68-5087 in Wisconsin in 1973. She died on 31 January 1986 at Beaver Dam, Dodge County, Wisconsin, at age 86. She was buried at Immaculate Conception Cemetery, Juneau, Dodge County, Wisconsin. [S14] Twelfth Census of the United States, Wisconsin, Dodge County, Beaver Dam; SD #1; ED #8; Sheet No. 12A; Line 27, Dwelling 216; Family 232; Genealogy.com image Roll 1784 Book 2 Page 26; MrFamily.com, Inc. 13 Feb 2004. [S137] Unknown record type, unknown repository address, Wisconsin, Dodge County, Beaver Dam Township, Beaver Dam City, Ward 2; SD # 36/2, ED #30, Sheet No. 6B, Line 83; Dwelling 125, Family 129; Ancestry.com image Feb 2004. ����� Katherine Nebl was also known as Katalin Nebl. She was born on 2 August 1894 at Apatin, Bacs-Bodrog varmegye, Hungary.1 She was baptized on 3 August 1894 at Apatin, Bacs-Bodrog varmegye, Hungary.1 She was the daughter of Wendelin Nebl and Anna Udvari. Katherine Nebl emigrated on 20 September 1904 from to America, Beaver Dam, Dodge County, Wisconsin; came to America with her mother, Anna UDVARY NEBL. She appeared on the census of 18 April 1910 at 415 Madison Street, Beaver Dam, Dodge County, Wisconsin; NEBL, Kate: Sister-in-law; Female, White, Age 16, Single, Born in Hungary-Magyar, Both parents born in Hungary-Magyar; Immigrated 1904; Speak English; Occupation - Carder (Woolen Mill); Read and Write = Yes; Attended school = No.2 She married Peter J. Kirchhofer, son of Johann Kirchhofer and Elizabeth Zimmerman, on 2 May 1911 at Beaver Dam, Dodge County, Wisconsin. As of 2 May 1911,her married name was Kirchhofer (Nebl). Katherine Nebl died on 25 January 1947 at St Lukes Hospital, Milwaukee, Milwaukee County, Wi, at age 52. She was buried at St. Peter's Cemetery, Beaver Dam, Dodge County, Wisconsin. [S50] Unknown subject entry, unknown record type, Apatin, Hungary #277. [S98] Unknown record type, unknown repository address, Wisconsin, Dodge County, Beaver Dam City (part of), Ward First; SD #5, ED #2, Sheet 6A; Line 34, Dwelling 87, Family 112; Ancestry.com image 16 Feb 2004. �����Peter J. Kirchhofer was born on 15 May 1890 at Apatin, Yugoslavia. He was the son of Johann Kirchhofer and Elizabeth Zimmerman. Peter J. Kirchhofer married Katherine Nebl, daughter of Wendelin Nebl and Anna Udvari, on 2 May 1911 at Beaver Dam, Dodge County, Wisconsin. Peter J. Kirchhofer died on 8 July 1952 at Memphis, Shelby County, TN, at age 62. He was buried at St. Peter's Cemetery, Beaver Dam, Dodge County, Wisconsin. �����Thomas James Godsell was born on 6 December 1904 at Clyman, Wisconsin. He was the son of Thomas Godsell and Anna Scully (Murray). Thomas James Godsell was farmer. He married Theresa Catherine Nebl, daughter of Wendelin Nebl and Anna Udvari, on 22 November 1932 at Beaver Dam, Dodge County, Wisconsin. Thomas James Godsell died on 28 February 1973 at Dodge County, Wisconsin, at age 68. He was buried on 3 March 1973 at Immaculate Conception Cemetery, Juneau, Dodge County, Wisconsin. �����Joanis Nebl died on 30 August 1890 at Apatin, Bacs-Bodrog varmegye, Hungary. He was born on 30 August 1890 at Apatin, Bacs-Bodrog varmegye, Hungary.1 He was the son of Wendelin Nebl and Anna Udvari. [S50] Unknown subject entry, unknown record type, Apatin, Hungary #344. [S98] Unknown record type, unknown repository address, Wisconsin, Dodge County, Beaver Dam City (part of), Ward First; SD #5, ED #2, Sheet 6A; Line 31, Dwelling 87, Family 112; Ancestry.com image 16 Feb 2004. [S116] Unknown subject, Milwaukee Catholic Cemeteries/Genealogy Search Results; http://www.cemeteries.org/includes/gen_03prt.asp?id=418364; 07 Feb 1007, Burial Record. [S73] Unknown author, "Individual Detail Chart", Darrell Dombek Individual Detail Sheet. [S73] Unknown author, "Individual Detail Chart", Individual Detail Sheet. [S2] Death - Obituary, (http://www.dailynewsol.com/obits/); West Bend Daily News; 03 Oct 2001. �����Casper Graff Jr. was born on 10 September 1918 at Beaver Dam, Dodge County, Wisconsin. He was the son of Casper Graff and Maria Katalin Nebl (Mary). Casper Graff Jr. was (an unknown value) at Farmer. He lived at farm, Allenton, Washington County, Wisconsin. He married Francis Peters on 20 October 1945 at Holy Angels, West Bend, Washington County, Wisconsin. Casper Graff Jr. died on 3 December 1986 at Home, Allenton, Washington County, Wisconsin, at age 68. He was buried at St. Anthony Cemetery, Washington County, Wisconsin. �����Francis Peters was born on 19 June 1919 at West Bend, Washington County, Wisconsin. She lived at farm, Allenton, Washington County, Wisconsin. She married Casper Graff Jr., son of Casper Graff and Maria Katalin Nebl (Mary), on 20 October 1945 at Holy Angels, West Bend, Washington County, Wisconsin. As of 20 October 1945,her married name was Graff (Peters). Francis Peters died on 24 September 1976 at Allenton, Washington County, Wisconsin, at age 57. Child of Francis Peters and Casper Graff Jr.
�����Anna Graff was born on 10 September 1918 at Beaver Dam, Dodge County, Wisconsin. She was the daughter of Casper Graff and Maria Katalin Nebl (Mary). Anna Graff died on 15 September 1918 at Beaver Dam, Dodge County, Wisconsin. She was buried at St. Peter's Cemetery, Beaver Dam, Dodge County, Wisconsin. [S137] Unknown record type, unknown repository address, Wisconsin, Dodge County, Beaver Dam Township, Beaver Dam City, Ward 2; SD # 36/2, ED #30, Sheet No. 6B, Line 84; Dwelling 125, Family 129; Ancestry.com image Feb 2004. [S120] Unknown record type, unknown repository address, WiscNews.com : Beaver Dam Daily Citizen Online; http://www.wiscnews.com/bdc/obituaries/index.php; 13 Aug 2005. �����Ardell Electa Stutz was born on 4 December 1922 at Town of Oak Grove, Dodge County, Wisconsin. She married John James Nebl, son of John Nebl and Adeline J. Cullen, on 16 November 1946 at Beaver Dam, Dodge County, Wisconsin. As of 16 November 1946,her married name was Nebl (Stutz). Ardell Electa Stutz lived at Beaver Dam, Dodge County, Wisconsin. Her Social Security Number was #394-18-9786 in Wisconsin before 1951. She died on 14 February 1991 at Madison, Dane County, Wisconsin, at age 68. [S73] Unknown author, "Individual Detail Chart", from Robert Nebl. [S17] Death Record - Local, Wisconsin, Dodge County, Register of Deeds, Dodge County Courthouse, Juneau, WI; Deaths Vol. 108 #428 researched 02 May 2003. �����Ann Kirchhofer was born on 9 September 1911. She was the daughter of Peter J. Kirchhofer and Katherine Nebl. As of 9 October 1944,her married name was Cooper (Kirchhofer). Ann Kirchhofer was nurse. She died before 1993 at Memphis, Shelby County, TN.